Some time ago, I taught some workshops and classes where students created a really funky card in the shape of a pair of thongs (aka flip flops) using gloss card and alcohol inks. Everyone really enjoyed themselves and it was a really fun class! So, as I've been playing with the oriental theme a bit lately, I thought it might be interesting to do an asian take on this and make the card in the shape of Japanese zori. The pattern only needed some slight alterations and with a change of embellishments, the card has taken on a much more oriental look. 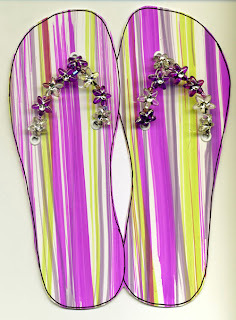 You can find the full instructions for the Funky Thongs (including a template) in Issue 57 of Australian Paper Crafts. 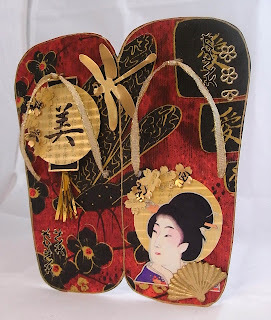 By the way, did you know that zori is the name given to the woven straw-soled sandals worn by Geisha. Those gorgeous wooden clog-type sandals with the little platforms are called geta. I love shoes, but I have no idea how you would walk in these - hats off to the Geisha who move so gracefully in them!